Since you believe in God, then you must put faith in all of the words of God and in all of His work. That is to say, since you believe in God, you must obey Him. If you are unable to do this, then it does not matter whether you believe in God. If you have believed in God for many years, and yet have never obeyed Him or accepted all of His words, but instead asked God to submit to you and act in accord with your notions, then you are the most rebellious of persons, and you are an unbeliever. How is one such as this able to obey the work and the words of God that do not conform to the notions of man? All those with a false understanding of God’s words are unbelievers. They do not have any real knowledge, much less any real stature; they are ignorant people without reality. That is, all those who live outside of the substance of God’s words are unbelievers. Those deemed unbelievers by men are beasts in the eyes of God, and those deemed unbelievers by God are those who do not have God’s words as their life. Therefore, those who do not possess the reality of God’s words and who fail to live out God’s words are unbelievers. There are some people whose belief has never been acknowledged in God’s heart. In other words, God does not recognize that these people are His followers, because God does not praise their belief. For these people, regardless of how many years they have followed God, their ideas and views have never changed. They are like the non-believers, adhering to the non-believers’ principles and manner of doing things, adhering to their laws of survival and belief. They never accepted the word of God as their life, never believed that God’s word is truth, never intended on accepting God’s salvation, and never recognized God as their God. They regard believing in God as some kind of amateur hobby, treating God merely as spiritual sustenance, so they don’t think it’s worth it to try and understand God’s disposition, or God’s essence. You could say that all that which corresponds to the true God has nothing to do with these people. They’re not interested, and they can’t be bothered to pay heed. This is because deep in their hearts there’s an intense voice that’s always telling them: God is invisible and untouchable, and God doesn’t exist. They believe that trying to understand this kind of God would not be worth their efforts; it would be fooling themselves. They just acknowledge God in words, and don’t take any real stand. They also don’t do anything in practical terms, thinking that they’re pretty clever. How does God look upon these people? He views them as non-believers. Some people ask: “Can non-believers read God’s word? Can they do their duty? Can they say these words: ‘I’ll live for God’?” What man often sees are the surface displays of people, not their essence. Yet God doesn’t look at these surface displays; He only sees their inner essence. Thus, God has this kind of attitude, this kind of definition, toward these people. If, in their belief in God, people don’t frequently live before God, they have no fear for God in their hearts, and so are incapable of shunning evil. These are connected. If your heart often lives before God, you will be held in check, and will fear God in many things. You will not go too far, or do anything that is dissolute. You will not do that which is loathed by God, and will not speak words that have no sense. If you accept God’s observation, and accept God’s discipline, you will avoid doing many evil things—and you will thus shun evil, right? If, in your belief in God, you often exist in a state of bewilderment, not knowing whether God is in your heart, not knowing what you wish to do in your heart, and if you are incapable of being at peace before God, and don’t pray to God or seek the truth when something happens to you, if you often act according to your own will, live according to your satanic disposition and reveal your arrogant disposition, and if you do not accept God’s scrutiny or God’s discipline, and you do not obey God, then people like this always live before Satan and are controlled by their satanic dispositions. Such people are therefore without the slightest reverence for God. They are simply incapable of shunning evil, and even if they don’t do evil things, everything they think is still evil, and it is unconnected to the truth and goes against the truth. So do such people basically have no connection to God? Though they are ruled by God, they have never reported before God, they have never treated God as God, they have never treated God as the Creator who rules over them, they have never acknowledged that God is their God and their Lord, and they have never considered worshiping God with their hearts. Such people don’t understand what it means to fear God, and they think it’s their right to commit evil, saying: “I’ll do what I want. I’ll take care of my own business, it’s not up to anyone else.” They think it’s their right to commit evil, and they treat faith in God as a kind of mantra, as a form of ceremony. Does this not make them unbelievers? They are unbelievers! The perspective of unbelievers is never accepting a single thing from God, but instead to employ human perspectives, mindsets, and methods to think hard and rack their brains to cope with whatever they encounter. This is what an unbeliever does. When you run into this kind of person in the future, you should develop some discernment regarding them. As soon as they encounter an issue, they think and think, they study this and that, and then resolve it with human methods. Either they reconcile differences regardless of principles, or they blame both sides equally, or they come up with reasons to justify themselves. They have never accepted from God any kind of environment He has arranged or anything that has happened around them. They don’t believe it was God’s doing. They’ll generally insist that they believe that mankind’s fate is in God’s hands and that they are willing to submit to His rule and His arrangements. However, that’s not what they believe when they encounter an issue, that’s not how they understand things, and they never obey in such a way. This is what an unbeliever is. Everyone within God’s family believes in God. However, there is one kind of person who, even though they claim that they believe in God, inside their hearts they have doubts about the existence of God, about the fact that God created all that is, about God’s rule over all that is, about God’s incarnation, about God’s word and about the truth. One aspect is that they are unable to confirm whether or not these things are true. Another aspect is that they still doubt, believing these things to be impossible. What do they believe in their hearts? They believe in all the things that exist in the material world. They believe everything that their eyes can see, and they believe everything that their hands can touch. They take a suspicious attitude toward anything that their eyes cannot see, to the point where they even do not acknowledge it. This kind of person only believes nominally in God, but in reality, they are just nonbelievers. I have heard that within western religion, 25% of pastors, that is basically 1 out of every 4 pastors, do not believe that the Lord Jesus was conceived by the Holy Spirit, and they harbor some doubts about the Bible. Amongst the western pastors, there are this many that are nonbelievers. Especially when it comes to the second incarnation of God, they become even more oppositional. They believe that God only exists in heaven and that God will never work amongst man. As a result, whoever says that God has come will be accused by the majority of western pastors as heretics. Wouldn’t you say that these people are nonbelievers? They are nonbelievers. Nonbelievers do not believe in the work of the Holy Spirit. They say, “This is something that is thought of by man. Man’s heart can be momentarily inspired and can sometimes become enlightened. But this has nothing to do with the Holy Spirit’s work.” They do not believe in the work of the Holy Spirit. Also, they do not believe that God’s words are spoken by God. They say, “These words were spoken by man. Who has seen God say these words? How could God say these things? This was spoken by man.” All those who do not believe in the incarnation of God or the work of the Holy Spirit, and even do not believe that the words of God are expressed by God or the Spirit of God, are nonbelievers. No matter how genuine they say their belief in God is, they are nonbelievers. A nonbeliever is not someone who claims that they do not believe in God. They say that they believe in God with their mouths, but their hearts do not believe. This is what it means to be a nonbeliever, and it can also be said that they are imposters. In religion, many people believe in God under the control of Pharisees, fully following them and listening to them. Like them, they only study the Bible and theology, only paying attention to understanding biblical knowledge and theological theory, and never focusing on seeking the truth or practicing the Lord’s words. Like the Pharisees, they only believe in a vague God up in heaven, but don’t believe in Christ incarnate of the last days—Almighty God. 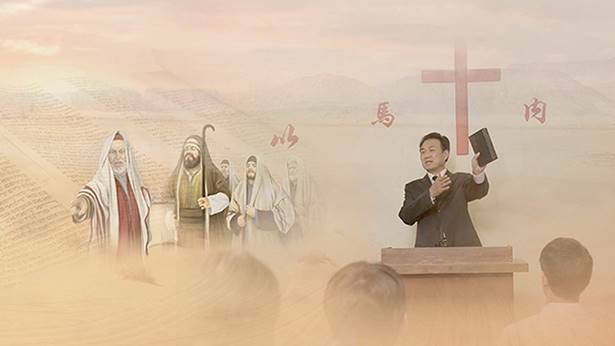 No matter how authoritative and powerful the truths expressed by Almighty God, they still stubbornly hold on to their notions and imaginations, and follow pastors and elders in resisting and condemning Almighty God. Needless to say, they are the same type of people as the Pharisees, and are walking the God-resisting path of the Pharisees. Even if they are not following the Pharisees, they are still the same type of people as the Pharisees and are also the descendants of the Pharisees because their nature and essence are the same. They are all unbelievers who only believe in themselves but don’t love the truth! They are antichrists who hate the truth and oppose Christ!